Located on the Clark Fork River and surrounded by five different mountain ranges, the city of Missoula is the county seat of Missoula County and is situated in the western part of Montana. The city is often known as the 'hub of five valleys' due to the many mountains all around and is a popular spot for outdoor enthusiasts. 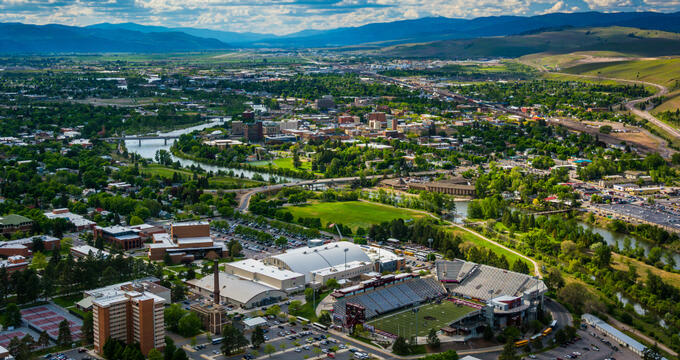 Missoula covers an area of 29.08 square miles and has an estimated population of around 73,000 people, with over 117,000 in the surrounding metropolitan area. Historians have found traces of human life in the area going back several thousand years, with various Native American tribes living in the land that would eventually become Missoula until European settlers started to arrive. In 1860, a little settlement named Hell Gate Village was established just a few miles away from the future downtown sector of Missoula, and the city itself was founded in 1866 and a fort was built in 1877 to offer some protection to the town. The arrival of the railroad network in Missoula helped the town expand and it was chosen as the ideal spot for the construction of the University of Montana. Many mills were opened up all around, with lumber being the key industry in Missoula for many years. Nowadays, the lumber industry has died down but the city has continued to thrive due to the university. Missoula is also home to around 400 acres of parks for outdoor activities and recreation. The elevation of an area is a measurement of how high it is in relation to the mean sea level of Earth. Elevation can be measured in feet or meters and has various uses. It's also an important factor in an area's climate, with high elevation areas having lower temperatures in general. The elevation of Missoula, Montana is 3,209 feet (978 m), which is higher than the national average of 2,500 feet (760 m). Many big cities around the United States and other countries are situated in coastal locations with relatively low elevations of 500 feet (152 m) or lower. The relatively high elevation of Missoula is due to the fact that it is surrounded by mountains and situated in Montana, which is one of the highest states of America overall. The mean elevation of the state of Montana is 3,400 feet (1,040 m), making it the eighth highest state, just ahead of Oregon. The highest point in all of Montana is Granite Peak, located in the Absaroka-Beartooth Wilderness at an elevation of 12,807 feet (3,903.5 m). The lowest point in the state of Montana is found at the Kootenai River on the Idaho-Montana border at an elevation of 1,804 feet (550 m). The city of Missoula has a humid continental climate with four distinct seasons. Summers in Missoula are hot and dry, while the winters are cold and often feature heavy snowfall. Over 37 inches of snow fall in Missoula per year and can occur at any time from October through to late April. The coldest month of the year is December, which has average lows of 17°F (-8°C), while the warmest month of the year is July, which has average highs of 86°F (30°C). During the summer months, the night-time temperatures can be much colder than the days in Missoula. As one of Montana's major cities and located right near the Rocky Mountains, Missoula offers a lot of opportunities to visitors and residents alike. It's a great spot for outdoor recreation, with 400 acres of parkland in the city limits and three nearby rivers. Activities like kayaking, rafting, cycling, hiking, and more can be enjoyed nearby, and a few major ski areas are located within relatively short distances. The city is also known as a key cultural hub for Montana, with a lot of museums, galleries, and live events aimed at people of all ages and backgrounds.